After winning the Western Athletic Conference tournament Saturday night, the New Mexico State men’s basketball team is advancing to the NCAA Tournament in San Diego. 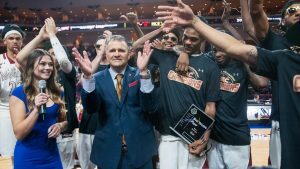 The Aggies’ performance in the WAC tournament earned them the championship title and a spot in the Big Dance for the sixth time in the past seven years. New Mexico State’s Jemerrio Jones was named WAC tournament MVP after breaking records for most rebounds in a single game and in the tournament. The team enters the NCAA Tournament as the No. 12 seed and is set to face off against No. 5-seed Clemson on March 16.